Many years ago, I wrote and published a book on Succession of Bloom in the Perennial Garden that explains how to plan your garden so that you have color every month of the growing season. This book came about because I was frustrated that most of the other books and catalogs that my students used for reference basically said most perennials “bloom all summer”. Nothing could be farther from the truth. My goal was to track when the perennials, bulbs, and flowering shrubs that we use in our gardens begin and end blooming right here in Connecticut. This is the lemon lily, Hemerocallis flava. 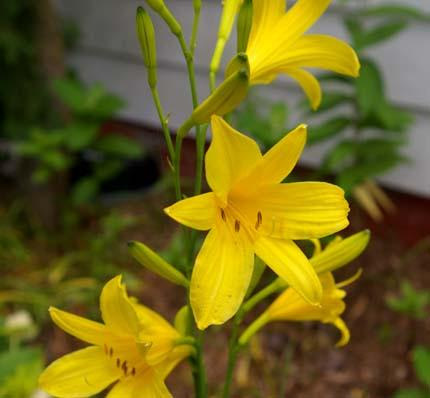 It is an old fashioned, heirloom daylily that blooms in June and is sweetly fragrant. It marks the beginning of the daylily season that will last for the next four months. Let us help you select varieties to extend your bloom season into the summer and fall. plants that they put in stop flowering and the garden turns green, perhaps even a bit disheveled or unruly.NOW is the time to plan and plant for your summer and fall garden. We are entering a new phase of the garden. The daffodils, tulips, azaleas, rhododendrons, and many of our favorite early bloomers are finishing up. There are lots and LOTS of plants that are budding up and getting ready to burst into bloom- you just need to know what they are and how to weave them into your landscape. 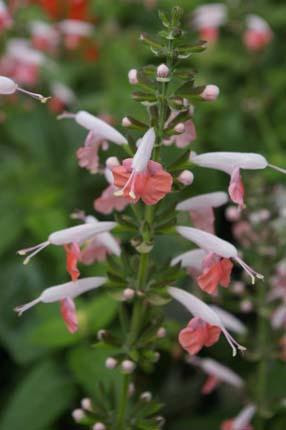 Salvia coccinea ‘Cherry Blossom’ loves hot weather and attracts hummingbirds to your garden. 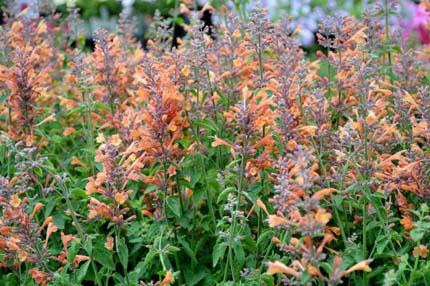 We carry all kinds of Agastaches including this ‘Acapulco Orange’ variety that will flower until late fall. The flowers and foliage are edible and taste like a combination of mint and licorice. Whenever we plant, we water our new additions in with Organic Plant Magic. This dehydrated compost tea makes the feeder roots grow and helps the plants get over any transplanting shock. It is so important that watering in with Organic Plant Magic is built into every estimate that we do for our landscape installations. What’s Bugging Your Garden this Week? Oh joy, there is nothing like harvesting fresh lettuce for a salad on a Sundayafternoon. Imagine my surprise when I found a slug in my colander of lettuce as I washed it! Yes, along with the much needed rain comes slugs, snails without shells, slimy creatures that come out at night and eat holes in your plants. One way to control them is to sink shallow cat food cans into the soil and fill them with beer. 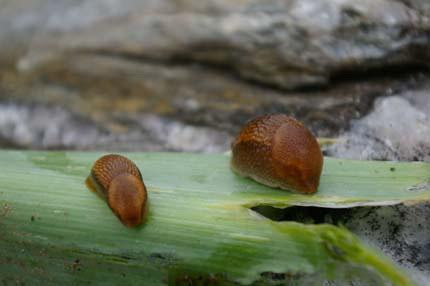 The slugs are attracted to the yeast in the beer, fall in, and drown. As we would rather drink beer than use it to drown slugs, in our own and in our client’s gardens, we use Sluggo, an all-natural product made from iron phosphate. 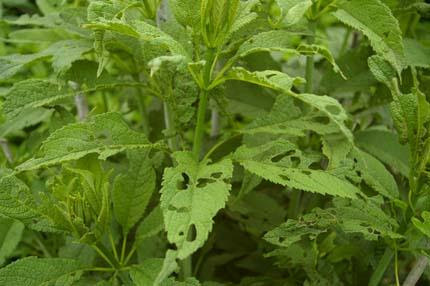 We have been getting lots of customers asking us why the leaves on our Joe Pye weed plants (Eupatorium) and our butterfly bushes have holes in them, yet they don’t see any insects. This is due to earwigs, another night-feeding insect that hides in debris at the base of the plants during the day. You can place an empty paper towel roll on the ground beneath the affected plants at night. In the morning, the earwigs will be hanging out in the tube and you can decant them into a waiting jug of soap and canola oil. Another alternative is to sprinkle Sluggo Plus at the base of these plants. This product contains not only iron phosphate, but also Spinosad, an organic insecticide which will kill the earwigs. Flea beetle damage on an eggplant leaf that has been dusted with diatomaceous earth. Another pest that people are asking is the flea beetle. These tiny black, fast flying insects chew small holes in your vegetable plants, especially eggplants and often, tomatoes. 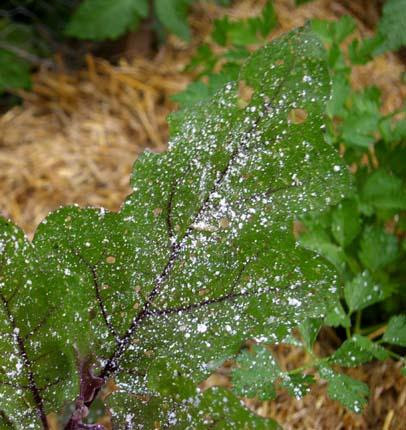 In my garden, I sprinkle the plants with diatomaceous earth, a crusty powder filled with silica. I do this in the early morning when the dew is on the plants. Using an old flour shaker, I cover both the top and bottom surfaces of the leaves. Spraying the leaves first with Hot Pepper Wax will also deter the flea beetles. Hot pepper (capsacin) repels bugs, it doesn’t kill them. Finally, everyone is talking about the gypsy moth caterpillars that seem to be plaguing us in great numbers this month. For true caterpillars, we use Bacillus thuringiensis or B.T. Spray this on the caterpillars when they are young. This means you should be walking your gardens daily and scouting for any pests to “head them off at the pass” before they become a really serious problem. Then, knowing exactly what the pest is and its life cycle will help you, and us, suggest the least toxic, most effective organic solution. To reference material from emails we’ve sent out in the past, click here.